Our mission at NaturallyCurly has always been to be a platform for women redefining 'beauty' on their own terms. That's why we're so excited to be partnering with EDEN BodyWorks as they hit the road this summer to help women all over the country define 'beauty.' The word is so much more than exterior looks. It encompasses all aspects of who we are from how we feel, how we think and what we put in our bodies. As women, we have the option to express ourselves through our hair, fashion, career and lifestyle choices. The possibilities are endless. 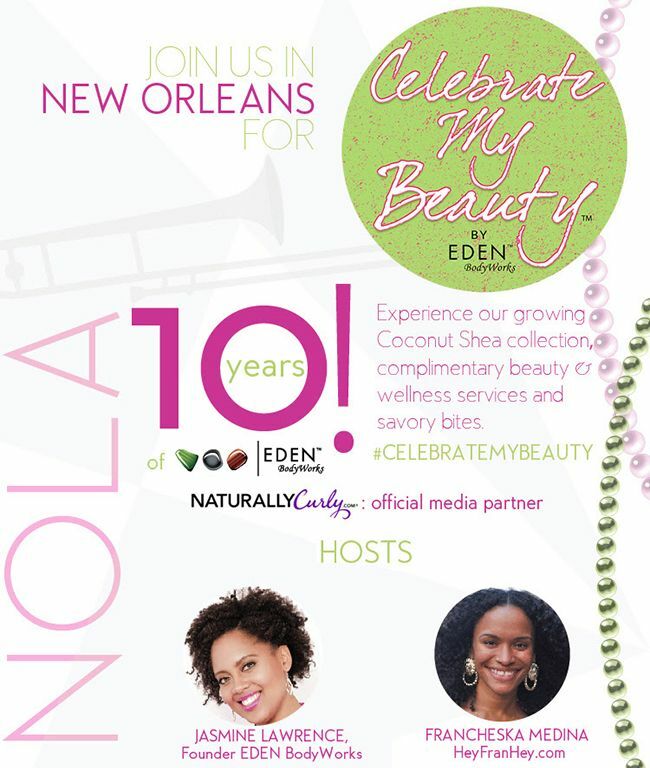 Kicking off in New Orleans during the July 4th weekend, “Celebrate My Beauty!” events will be hosted by our curlfriend Francheska Medina, natural beauty, nutrition and fitness expert and the voice behind HeyFranHey.com alongside EDEN BodyWorks Founder, Jasmine Lawrence. The brand invites guests to enjoy the “Celebrate My Beauty!” experience and walk away inspired, pampered and renewed. Our own Social Media Manager, Evelyn Ngugi, will be in attendance to provide a NaturallyCurly play-by-play of how women across the country are expressing their own unique beauty. “Having healed myself from a chronic illness using natural foods, alternative medicine and exercise, I am passionate about awakening a health-based curiosity in others. Working with a brand like EDEN Bodyworks, which focuses on the use of natural ingredients, is the perfect alignment with my mission statement. I'm looking forward to joining "Celebrate My Beauty!” because there is no greater glow than healthy beauty from the inside out!” says Francheska "Hey Fran Hey" Medina. This post is sponsored by EDEN BodyWorks.